Well, who needs a bass player anyway? Or a drummer? I cannot remember the last time a jam session stuck so resolutely to the upper register, but no matter, we had an afternoon of singers – Miss H, Miss K, Miss Amy, Miss Smiff, I think I have missed everyone, other than Scott and Buddy…. Whatever, Miss Smiff played drums most of the afternoon, in a manner that goes a long way to explaining why the music was so good: especially when the Captain called fours and she managed the percussive equivalent of raising two fingers. More eloquent than elegant. By way of diversion, Mark was showing edited highlights of his recent parachute jump between numbers. I have always though (fondly) that several of the jam sessions regulars were slightly demented, but Mark is now officially an out and out lunatic, with the video to prove it. Strewth! Last week, Anne Hayres entertained on Friday, for a crowd that seemed more intent on gossip than listening at times. Risa had another good crowd on Saturday, and entertained them as only Risa can. More please. This week, Ruby Rogers is belting it up again on Friday 26th October. Judging by the sequins littering the carpet last time, almost anything could happen. She has a bunch of new ballads to try out, as well as reprising her recent recording. Avi Ganesan on bass, Tom “Snooze” Doublier on drums. Saturday 27th October, and Amy Jaulin will be giving the tonsils a workout. A range of jazz ballads and up tempo numbers, worth a visit just for the high notes and the false eyelashes… Andrew “smooth as” Lye takes over bass for this one. So You Would Like a Session at The Grand? Stats for October: we will have used 8 singers, 6 bass players, 3 drummers and 3 pianists this month. 19 of the 20 have previously attended jam sessions. 2 had their first session at the Grand. There are currently 14 singers interested in a Grand Hotel Session, as well as 8 bass players, 5 pianists, and 6 drummers, and 6 soloists. Organising two line-ups a week is a little taxing. The aim is to put together a singer, drums, piano, bass and a solo instrument to play three sets..We are trying to introduce new players from the Jam Sessions as much as possible, mixing them up with the more experienced musos. Get in touch with meself or Col at the Leinster jam and we will do our best. Good opening lines include “I was playing at the Leinster and it occurred to me…” because we should all encourage the jammers; although you could try “I have a 19 year old niece in showbiz and…” If that doesn’t work, you could try “I am a 19 year old niece in showbiz and… ” . ‘Jazz Notes’ at Eltham and Brunswick Great news: we’ve just learned that we’ll be playing at the Eltham Jazz, Food & Wine Festival in February 2013. In the mean time, we have two Sundays (28 Oct and 4 Nov) to go at Bar Oussou. Well, I wouldn’t know what was going on, but you have to start somewhere, apparently. And finish up at the Gold Street Gossip Shop Municipal Tearooms for a Sunday Arvo jazz picnic. Which was, as picnics should be was a lavish spread: delightful concoctions from singers Kay, Chelly, Melinda and the mercurial Angie/Eadie – ain’t she all growed up.. Savoury treats from Captain Chaos and his cohort of saxmen, all laid out on a blanket of rhythm from Ben (g) Stan then Adam (b) and Gentleman John and Bob on (p). Miss Smiff, divine as ever, turned up late and complained she couldn’t hear the piano. She normally complains that she can hear the piano so this was a pleasant change..
Last week saw Juliane strut her stuff with the Italian Mafia, ably abetted by Andrew Lye on bass and Captain Chaos himself. The Deutsche Wunderkind singing better than ever. Saturday turned up quite a surprise: Ashley flew in from Wangaratta, and was joined by Miss Kay on backing vocals – blew me away, and I daresay the Captain as well, judging by the raised eyebrows and the grin on his face. Drew an appreciative audience too. This week, The John Curtis Slightly Small Big Band featuring Ann Hayres on vocals but I am not quite sure who else will stomp it up on Friday 19 October. John has the happy knack of getting good combos together, and a night of smooth jazz is in store. On Saturday 20th< October the glamorous and talented Risa is back for what promises to be a huge night. Now I have said that there will probably be an audience of five, but if you are one of them, you are in for a treat. The backing line-up is Jeremy (double bass), Simon Atkinson (drums) and meself on piano. There may be a rare appearance by Captain Chaos. Well, if not rare, at least lightly toasted..
Count Basie 11- Piece – really! Hello everyone! I’m happy to write to you again after a break & hope you’re all fine. Just to let you know about some gigs I’ll be doing these week in case you want to hung out with us ;have fun & listen to some music. 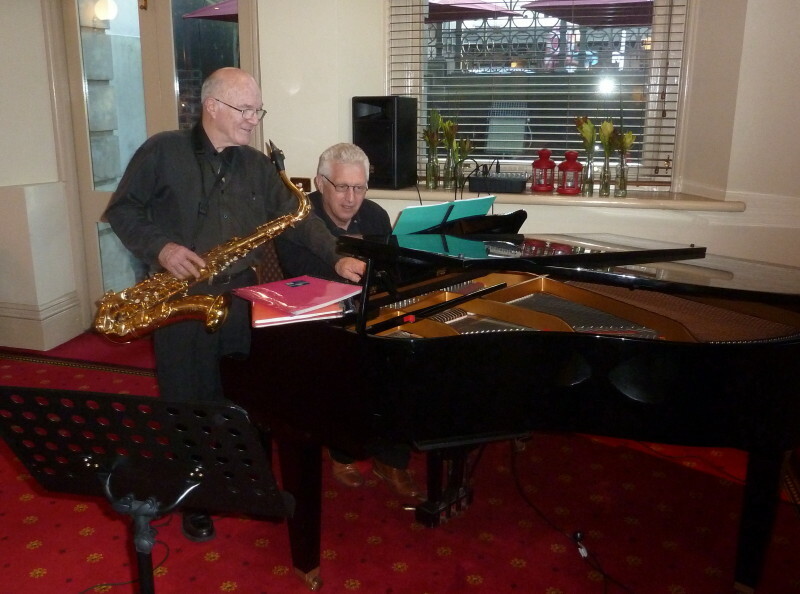 Today Thursday 18, I’ll be with with “jazzures” at THE CITY TILER” 115 Bay st / Port Melbourne 7pm….and soon we’ll start doing shows with the trio now that we’ve found the right bass player and it sounds great !! So if you’re in the South side and want to hear cool,modern jazz and have dinner or drinks in a beautiful place! Then that’s it. Supported by LOS AMATES MEXICAN RESTAURANT, you’ll also find food & drinks etc. And with SIN FRONTERA BAND as part of our October’s residence in SANTA ANA RESTAURANT 138 Acland st St Kilda. 7:30pm for more food, drinks, fun & music !! Hope to see you there and have a great weekend !!!! Oh, the Haggis, the Haggis. (1)..
Hamish McScrooge (2) has only recently taken up residence in Altona West. Hamish now runs a haggis shop that simmers beneath the glowering towers of the Altona West refineries, not a stone’s throw from Refinery Terrace. Hamish knows this is not a stone’s thow, as the basaltic shrapnel with which Marge habitually farewells departing merchant seamen occasionally falls short and lands in his haggis pot instead.. That such detritus makes little difference to the culinary qualities of his haggis speaks volumes for the limited dollop of gristle, a pinch of bones and a light dusting of old barley that constitutes his version of this Scottish delicacy. And when I say speaks volumes, it is just as well, for others have been rendered speechless by its mercifully unique flavour. Which brings me, neatly you will agree, to the Sunday Arvo Jam session. The key ingredients of a jam session have traditionally been limited competence, with a pinch of enthusiasm, and a light dusting of musicianship to hold it all together. Sort of. At last Sunday’s egregious (3) jam each and every combination turned out some great music, and there were, truly, no duds amongst them. So props to Adam on bass, Chelly, Kay and Deb singing, Keef, Lee and another trumpeter whose name I do not remember, Ben on guitar, Bob at the piano, Louis the fly, Tom, Jack and all the others too humorous to mention. And to Captain Chaos for another afternoon of misplaced musical direction, which nearly half of the participants had the good sense to ignore., whilst the rest were just confused. No matter, it all turned out fine…. Would that Hamish McScrooge’s haggis was as good. What’s On at the Grand? Last Friday, Carol Whitfield’s considerable army of friends turned out to hear her sing, and a fine night was had by all. Brian (bass) survived his Grand Hotel debut, Tom on bass and Keef on sax – with a sit-in from Ray “Lounge” Hood to boot. A busy night. Saturday and the Curtis Crew provided (I am told) some fine backing for the ever smooth Miss Kay. The evening may have ended with the entire band tap dancing on the piano lid (4).. This Friday is European Jazz night, with Vincenzo and Danilo leading the Mafia Band, and Koln’s finest export, singer Juliane Pasternak will be trying to keep everything in order. Should be a great night. On Saturday, Ashley (Wangaratta’s finest export) will be singing, with Kay Young on backing vocals, Simon Atkinson (drums) Bruce Packard (bass) and meself on the piano (or under it if they try the tap dancing stunt again). (1) A misquote from Apocalypse Now, itself a misquote from Joseph Conrad’s Heart of Darkness, which was probably lifted from Shakespeare’s King Lear anyway. (2) Hamish McScrooge: Hamish, you may recall, is the founder of the West Lothian Blues Society, which only held one meeting where they all got roaring drunk, due to a misspelling on the invite. (4) This might not be true.. Contrary to previous advice, Jazz Notes did not finish at Bar Oussou, last Sunday. We’ll continue playing some smooth and Latin jazz with a bit of funky pop at Bar Oussou in Brunswick for the next four weeks. Join us for a drink or a cup of coffee; perhaps even a bite to eat.